Responsive Web Design is becoming more and more important for website owners as the volume of traffic from hand-held devices increases. We are now at the point where almost 60% of website visitors are viewing your website on a tablet, phone or some other handheld small screen device. To add to the importance, Google has recently announced that it wiil include a websites "Mobile Friendliness" in its criteria for searches from April 21st 2015. This can only mean that non responsive or non mobile friendly website will be penalised and therefore not appear as high up the rankings as they once did on mobile devices which would equate to you potentially losing 60% of your target audience or potential sales. Google have already included support for the feature in their search results page on mobile devices. 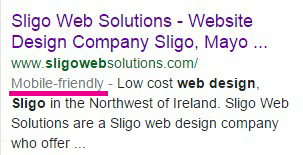 If you do a Google search on a mobile device now, you will see in the websites description whether or not the website is mobile friendly. It's now more important than ever to upgrade your old website to a mobile friendly, responsive one. If you don't, you could find yourself falling off the first page of Google and I'm sure this will also be the case for other search engines as Google would be the benchmark for them. Get in touch with us today and we can give you a free quotation to upgrade your website to a mobile friendly website.